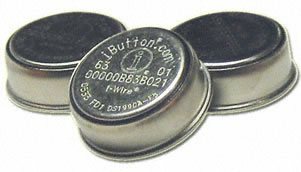 The DS1996 iButton is a portable data carrier that can store up to 64kbits in nonvolatile memory. It communicates with a processor using the 1-Wire protocol through a hardware port interface. The port interface provides both the physical link and handles the communication protocols that enable the processor to access iButton resources with simple commands. Other memory includes a unique, 64-bit registration number and a 256-bit scratchpad from which data can be verified before copying to memory. An overdrive mode boosts communication speed to 142kbits/second. The DS1996 is extremely durable and can be attached to an object, person, or circuit board by means of accessories. Applications include access control, work-in-progress tracking, storage of calibration constants, and debit tokens.